We've got all the equipment your Spa needs to provide the most exquisite skin care treatments. Steamers and Vaporizers are must-have items in any facial treatment room. The warmth from the steam helps to detoxify the skin, softening plugs in pores for easy removal of dirt, blackheads and dead skin debris. Steam permits deep cleansing, delivers oxygen, water, and valuable nutrients. It also helps to increase circulation, allowing the skin to look refreshed and youthful. This encourages re-hydration and rejuvenation to the outer layers of skin. 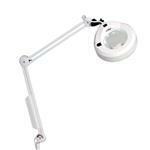 Magnifying lamps, also known as "loupes", allow the esthetician to clearly see the skin in detail, including all the things that are masked by makeup or are too small for the eye to easily see. When selecting a magnifying lamp make sure to understand what diopter lens you should choose. Diopter refers to the curvature of a lens. As the diopter increases, the lens becomes thicker and the curvature greater. As the curvature increases, light rays are redirected to fill a greater portion of the viewer's retina, which makes the object look bigger. The higher the diopter, the more magnification the lens provides. Lighted magnifiers reduce eye strain and fatigue while allowing the user to see the small details of the object being viewed, which allows for a better treatment solution and results for the client.